The II UNESCO Youth Forum in Almaty was held on 8 September 2017. Holding of the UNESCO II International Youth Forum “Youth cooperation in the field of strengthening intercultural dialogue and prevention of violent extremism” (hereafter Forum) was based on understanding of importance of the critical role of young women and men in development of intercultural dialogue and mutual understanding, which are the basic principles of the global sustainable development programme, against the backdrop of expanding socio-political phenomenon in the modern world which makes all states and societies vulnerable to outbreaks of violent extremism. 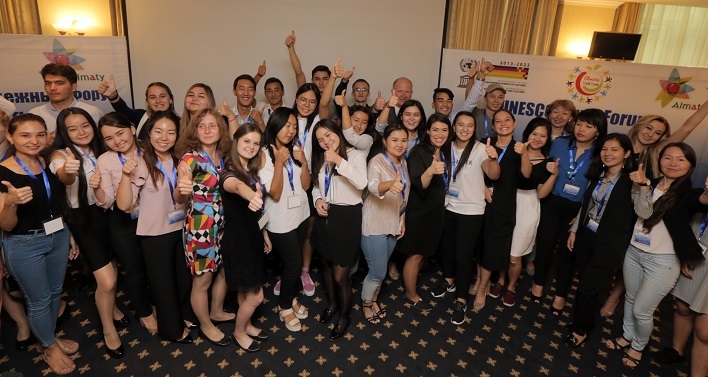 The forum was conducted in the context of the International Decade for the Rapprochement of Cultures, 2013-2022 and in the context of celebrating the International Youth Day (12 August) and the International Literacy Day (8 September). 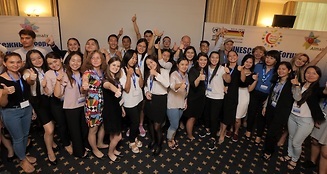 A total of 90 young representatives from Afghanistan, Egypt, Kazakhstan, Kyrgyzstan, Tajikistan, Tatarstan (Russian Federation) aged 17 to 30, and also 10 representatives of the national and international organizations took part in the Youth Forum. Such kind of participation instilled confidence that this event became a starting point of creation of youth networks in the region in the relevant fields and gave an opportunity for young participants to work closely with decision-makers in creation of inclusive, tolerant and cooperative society, based on mutual respect, human rights and freedoms. 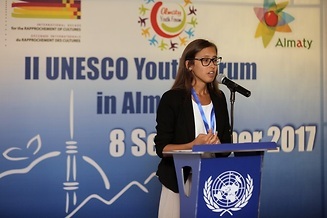 The key objective of the event was arranging a discussion platform for young people from different countries for deep and thorough discussion of the main challenges of intercultural dialogue and subsequent collaborative elaboration of recommendations for politicians and authorities on prevention of violent extremism in the region. •	Engage youth in UNESCO’s programme activities/work. 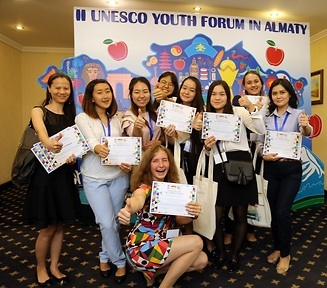 The Forum was organized and held by the UNESCO Cluster Office in Almaty under support of Almaty City Mayor Office, that productively worked together on advancement of the effective youth policy, understanding that these days the numerous youth population recognizes the need for changes and demands respect for fundamental rights and freedoms, including respect for their cultural authenticity and heritage, and looks for new opportunities to learn to live together in the age of globalization for a greater future.